In February of this year, Bridge celebrated 30-years as a trusted mental health and wellbeing services provider to the community of Greenwich, London. In evaluating past successes, it was clear that Bridge’s holistic approach to wellbeing was making a positive impact in their immediate area. The time had come to look for opportunities to extend their service delivery into under-served communities. As an organisation who relies on grants, they would need to increase and nurture their relationships with health care commissioners, donors and fundraisers. That meant that Bridge was in need of a marketing partner, and Struto leapt at the opportunity. The kick-off campaign that Struto delivered for Bridge in December had produced remarkable results, and fairly rapidly at that. By February, Bridge’s overall website traffic was showing an upwards trend, despite the tumultuous Christmas and New Year period. Post-launch optimisation had almost doubled the conversion rate on the content offer, The UK Family’s Pocket Guide to Common Mental Illnesses & Disorders. We were on a high. The campaign was acing its mission of connecting people who are affected by mental illness and their loved ones with the resources and encouragement needed to get started on their journey to recovery. The next step in our marketing mission was to establish contact with health care commissioners. In the UK, these are the individuals who are tasked with allocating grants and commissioning services from local providers, such as Bridge. It was to be expected that corporate donors would keep themselves scarce, and we soon came to know health care commissioners as a similarly elusive species. Our first avenue of persona research, LinkedIn profiles, delivered but a small pool of data as a significant number of local commissioners have opted to go nameless, faceless, and heavy on data privacy. What we deduced about our target persona from the exercise, was their apprehension to direct approaches and outright proposals. Numerous studies backed the efficacy of Bridge’s approach to improving a community’s health and wellbeing. Only relaying these research results in an informational format, however, would not be enough to capture our audience’s attention. 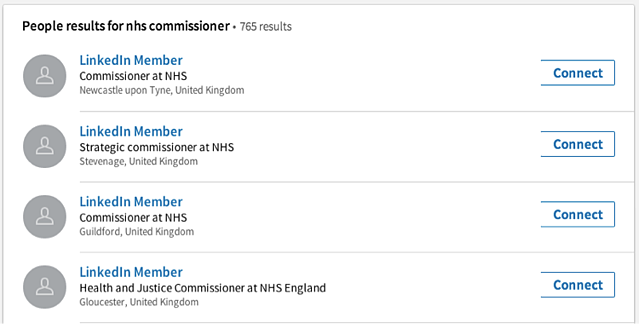 The mandate of NHS commissioners is to take responsibility for planning and purchasing healthcare service for their local population with the goal of improving their communities long-term health and wellbeing. Our campaign's messaging would illustrate how Bridge's approach provides a method to achieve this goal. The campaign we conceptualised would invite our persona into a story that illustrates the impact of research data on the lives of individuals, families, and communities. The content offer, The Tales of Three Young British People, would contain narratives with more than one possible outcome. The different outcomes would illustrate the value of early diagnoses and intervention in the development of mental illness. The stories themselves would make a heart rendering and compelling case. But we wanted more. We needed our readers to experience their power to alter the outcome of people’s lives and a community’s wellbeing by investing in these kinds of programs. We planned to create a ‘choose your own ending’ book. Translating this concept, borrowed from the paperback section to a digital world would require creativity and flair. It turns out, we had just the right guy on our team. Struto’s trusted Graphic Designer, Brian Akermann, took to the idea with little explanation needed and wowed us with his interpretation. A navigational tool was introduced at the beginning of each of the narratives, putting the reader in charge of selecting an outcome for the story. 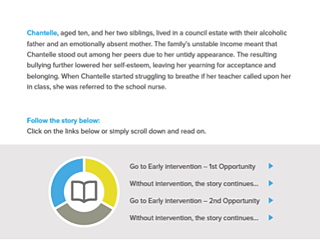 Choosing for an early-intervention would transport the reader to an outcome where appropriate treatment and support initiates a journey to recovery. Choosing to continue a story, without intervention, revealed the much greater personal and social impact, of late intervention in mental illness. Since commissioners carry the responsibility of improving their communities' health outcomes with a limited budget, we needed to illustrate both the cost efficiency and efficacy of an early-intervention approach. While the three tales would tell the story of the emotional and social impact of late-interventions, Brian illustrated the financial implications by placing micro-infographics at the end of each story. Creating an emotionally compelling and data-based narrative is one thing, but how do you convince your audience to download the offer in the first place? Brian sourced evocative imagery to illustrate the pages of the book, the cover, and to accompany promotional messaging. "It was important for me to take a stand against mental health stigma, you know? I wanted the people in the images to look like you and I because they are 'our people'. I knew I had to source images that everyone could relate to, but at the same time they had to illustrate the emotional value of stories. That was the main idea, but I also considered the integrity and style of the brand to be of high importance." Our interactive story was set up to captivate our readers and compel them to take action. While the campaign was primarily aimed at convincing commissioners to join the Bridge commissioners network, we could not exclude the possibility of reaching potential donors with the eBook. 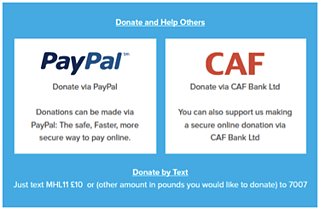 To provide for these scenarios, a call-to-action was added to enable readers to complete a donation transaction in no more than three clicks. While the campaign has only just launched and the jury is still out on our reader’s reviews, Bridge themselves have given the eBook a significant vote of confidence. As soon as all the campaign’s blogs have gone live, Bridge will make The Tales of Three Young British People available for purchase on Amazon.com.